Few days to the planned nationwide strike, slated from Tuesday, November 6, by labour unions in the country to press for N30,000 minimum wage, Justice Kado Sanusi of the National Industrial Court in Abuja has ordered them to shelve it, pending the hearing of a suit before the court. 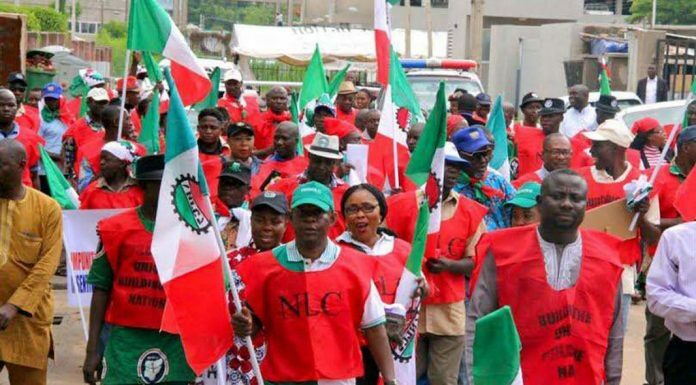 Regardless, President of the Nigeria Labour Congress (NLC), Comrade Ayuba Waba has insisted that the joint Central Working Committee (CWC) would stand by the resolution of the national executive council to begin indefinite industrial actions from November 6, except the government accepts and begins the process of perfecting the payment of N30,000, as negotiated, before that date. Justice Sanusi gave the order while delivering ruling on an exparte application brought before the court by the Federal Government and the Attorney General of the Federation (AGF). He ordered that the processes be served on the defendants in the suit, which are the Nigerian Labour Congress (NLC), the Trade Union Congress (TUC) and the Incorporated Trustees of the Nigerian Governors Forum. Ruling on the exparte application, the judge agreed with the submission of the Solicitor General of the Federation (SGF), Dayo Apata, who filed the suit on behalf of the government that the planned strike, if allowed to go on, would have grave consequences on the economy and the people, particularly those in urgent need of medical care. He subsequently adjourned till November 8th for hearing of the main suit. However, following its failure to reach a compromise with the government, the Organised labour had announced that starting from November 6, it would embark on an indefinite strike to press home its demand for an upward review of the current minimum wage of N18,000 monthly pay. It initially demanded for N65,000, but following various meetings with the representatives of the government it was reduced to N30,000. Meanwhile, there has been a stalemate, as the federal government on its part insisted on paying only N25,000 while the states government claimed they cannot go beyond N22,500. The stalemate therefore prompted labour to call for an the indefinite strike until their demands were met. Wabba, who spoke in Lagos, urged Chairman of the National Minimum Wage Tripartite Negotiating Committee, Ama Pepple, to submit the report of the already concluded National Minimum wage negotiation to President Muhammadu Buhari for transmission to the National Assembly for consideration and passage into law. The labour leader, who addressed a media briefing organised by the joint Central Working Committee (CWC) of all registered trade unions in Nigeria, noted that the joint CWCs of organised labour in the country “considered the recent mischief by government as an attempt to impeach the outcome of the concluded new national minimum negotiation. “It was resolved after taking the report of organised labour of what transpired at the tripartite minimum wage negotiating council committee that if government fails to respond and address the issues of making sure the report is signed and submitted to President Buhari and him putting in motion processes that would transmit a bill to the National Assembly, enactment of a new national minimum wage, certainly, the National Industrial action will commence by November 6 by midnight,” he noted. According to him, “We dialogued and also negotiated in line with Convention 87 up to a process of taking us more than one year, and at the conclusion of the meeting when workers are expecting to benefit from the minimum wage, all these issues are coming up. “The demand is very straightforward, we are open to dialogue, but dialogue must have an end. If we must have dialogue for one year and there is no end to that, certainly there is deceit, and we are not ready for that, we will not actually participate in a process that will not have an end. This is where we are now and it is unambiguous that a worker who creates wealth needs to be taken care of.